March 7th came into effect the new speed limit of 110 kilometers per hour (68 mph) on the Spanish motorways, reducing the maximum speed of 10 kilometers per hour. The Government has decided to establish this temporary measure, as prevention to the riots that are taking place in the Arab world, which cause that the price of oil is in constant growth. It also aims to save energy and to save fuel at the possibility that it becomes scarce due to the conflict. 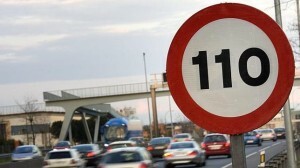 The controversy of reducing in 10 km/h the speed limit in Spain will remain so until at least late June as part of a series of measures to reduce consumption by more than 5%. Spain’s Socialist government intends to save the country from importing millions of barrels of oil per year and also expects to reduce annual CO2 emissions by 12.5 million tons. The government is furthermore reducing the price of commuter train tickets in order to persuade more people to leave their cars at home and use public transport. The new limit of 110 km/h on motorways and highways is becoming one of the most controversial measures recently taken by the Government. Many drivers have expressed their unease with the measure, despite the savings produced by driving 10 km/h slower, which varies considerably depending on the car and which the Government estimated at between 11% and 15%. It is still early, but it seems that’s a savings that will serve to mitigate in part the avid consumption of oil by Spain, extremely dependent on Arab producing countries. How much fuel is saved by reducing speed? A gasoline car, traveling at 120 kilometers per hour, consumes an average of 8.58 liters per 100 km. If you reduce speed to 110 kilometers per hour, consumption will drop to 7.64 liters. Thus can be saved nearly 1 liter of fuel per hundred kilometers. In Spain there are currently around 22 million cars circulating. Taking half of these vehicles and assuming that they are moving only to go to work about 10 km round trip, it would be about 2400 km per year by each vehicle. The savings with the current gasoline price is 31 Euros per vehicle. It seems small, but if multiplied by 10 million vehicles in transit every day, adds a savings of 312,000000 € per year on fuel. If you choose car hire Malaga for your transportation, remember the new speed limit and drive safe during your holidays in Malaga.